Sunchaser Ocicats is a small breeding cattery, located in Perth, Western Australia. We breed beautiful, playful, friendly ocicats, focusing on health, temperament, and type. Please contact us if you’re interested in adopting one of our kittens. Ocicats combine the sleek, elegant look of a spotted wild cat with the sweet nature and gentle temperament of a domestic kitty. 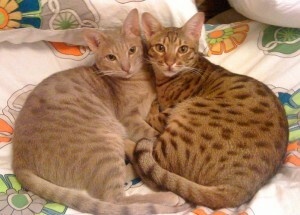 The ocicat breed is adventurous, curious, intelligent and affectionate. They thrive on the company of people, and are often described as ‘dog-like’ in their devotion to their families. Larger than most domestic cats, an adult Ocicat averages 3 – 7 kg, with females about 25% smaller than males. Ocicats revel in busy, active households and eagerly enjoy the company of other family cats, dogs and other pets. Most Ocicats are also quite extroverted around strangers and visitors. Ocicats do not like being left alone for long periods, and will certainly get lonely when you’re not around. Consider getting a companion cat or dog for your Ocicat rather than leaving him or her alone all day while you go out to work. The Ocicat’s spotted coat comes in 12 recognized colors: tawny, chocolate, cinnamon, blue, lilac (or lavender), fawn, ebony silver (or black silver), chocolate silver, cinnamon silver, blue silver, lilac silver, and fawn silver. Ocicats are active and playful, but also happy to purr on your lap or draped across your shoulders. Ocicats are exotic to look at, but are easy to keep and require no special care. The low-maintenance Ocicat coat can easily be kept looking its best by rubbing a chamois or soft brush over it once a week to remove dead hairs. The Ocicat diet is the same as any domestic and their short coats need only the occasional bathing and grooming. Ocicats are generally healthy, not prone to any particular illnesses or health issues.